This week we see the first of 6 trials Jesus must go through on his way to the cross. As he stands before Annas, the former High Priest, he is questioned to determine a charge against him. 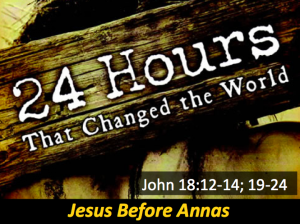 Jesus and Annas have a history and this plays a role in this particular trial. To prepare, read John 18:12-14 and 18:19-24. Also, read John 2:13-22 and Matthew 21:12-17. Although these may seem unrelated to John 18 they are not. Come this Sunday and see why. The Bible study is currently on a summer break. Stay tuned for monthly potluck get togethers! 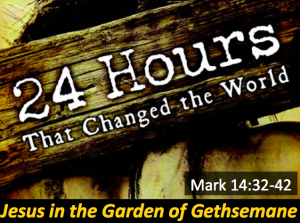 This week we return to the Garden of Gethsemane and find a large group of people looking for Jesus. They are ready for a fight and a hunt– expecting Jesus to run or hide. Jesus, however, does neither. When Jesus is arrested we will see his glory, his power, and his love against a backdrop of evil, injustice, and betrayal. To prepare, read John 18:1-11. You can also read the account in the other three gospels: Matt. 26:47-56; Mark 14:43-52; and Luke 22:47-53. I encourage you to read each of these passages and see how Jesus moves purposefully to the cross. Since January, we have been walking with Jesus throughout the Gospels. Now we focusing on the last 24 hours before the crucifixion. Last week we watched as Jesus lovingly washed his disciples feet–cleaning away the dirt and grime we all pick up in a world corrupted by sin. This week, we will walk with Jesus to a garden outside the walls of Jerusalem near the Mount of Olives. 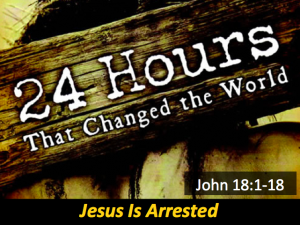 We will see him in the moments before his arrest and continue to see how he loves his disciples– and us– “to the end”. The account of Jesus in the Garden of Gethsemane is recorded in Matthew, Mark, and Luke. We will focus primarily on Mark’s account (Mark 14:32-42). I would encourage you to also read Matthew 26:36-46 and Luke 22: 39-46. This week, we will be with Jesus and the disciples in the Upper Room during their Last Supper together. To prepare, read John 13:1-17. Last week we saw that it is, indeed, very hard for a wealthy person to enter the Kingdom of Heaven. A rich, young ruler approached Jesus to find out what he needed to do to inherit eternal life. Jesus responded that he must follow the commandments and give everything he had away. This proved to much and the young man went away sad. 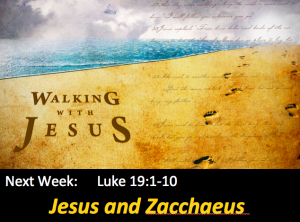 This week we encounter another rich man named Zacchaeus. He is very different than the rich, young ruler. Much lass impressive, yet wealthy. But his story ends differently. Why? To prepare, read Luke 19:1-10 and discover the reason!